What is an Oil Analysis and why do my Employees Need Training for It? NTT Inc. - What is an Oil Analysis and why do my Employees Need Training for It? Lubricants are the lifeblood of oil-wetted equipment. Testing fluids in an engine tell plenty about its condition. Oil analysis is an important maintenance process that provides information about lubricant contamination, machine wear, and the lubricant condition. Your maintenance employees will often make important decisions based on oil analysis results. The main benefits of oil analysis include contamination control, condition based analysis, avoiding oil mix up and failure. Oil analysis is an efficient and nondestructive way to gauge the health of an engine by sampling and analyzing the oil for different properties and materials that show signs of wear and contamination in an engine, hydraulic system or transmission. Sampling and analyzing of oil on a regular basis helps to establish a baseline of normal wear and can enable you to note when contamination or abnormal tear occurs. One of the reasons why you should use oil analysis is to determine the optimum oil drain levels. Through oil analysis, you can be able to determine the right drain interval so that you only change oil after its depleted or safely extend the oil change intervals. 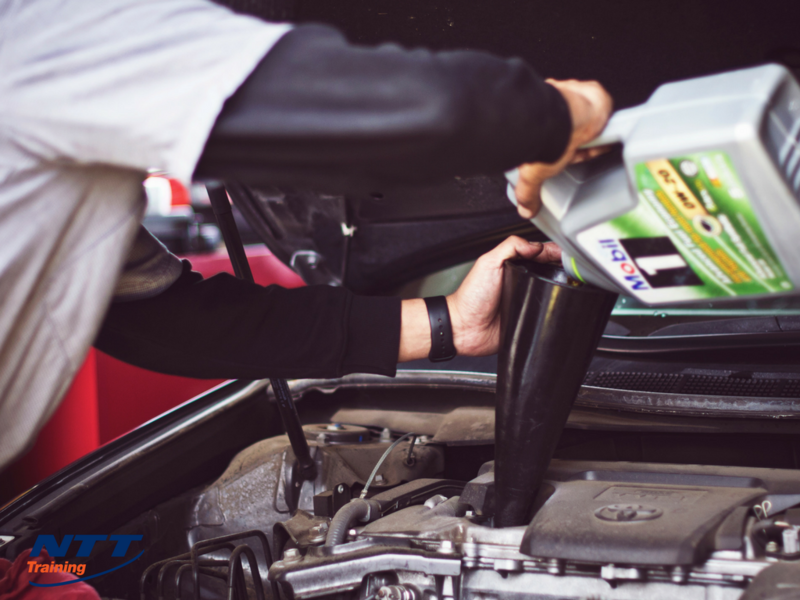 Sampling the engine oil at a time when it requires an oil change will help determine whether there is coolant or fuel in the oil, the viscosity is still in grade and if the additive elements have been depleted or are still active. If the oil analysis indicates that everything is good, for instance at 8,000 miles on a truck engine, you can run the oil further and conduct another oil analysis after a 2,000-mile interval and keep going if the oil analysis continuously shows that it hasn’t been degraded, depleted, or contaminated. Through oil analysis, your employees will determine the optimum drain level through facts and not guesswork. Therefore, if you have a fleet of identical trucks, you can conduct an oil analysis on one and use the results to establish the drain level of your fleet. You can also conduct oil sampling if you notice a change in the normal operation of an engine. In case the oil level ‘grows’ you should conduct an oil analysis to investigate where the additional material is coming from. Sometimes this can mean that there is coolant in the engine oil, there is a bad fuel injector that is leaking unburned fuel into the oil, there is a leaky head gasket, or there is a broken or deteriorated O-ring seal on the liner. In any event, the presence of coolant or fuel in the oil is a severe condition that can only be identified through oil analysis. Why Does Oil Analysis Require Employee Training? Correct sample taking, accurate oil analysis report interpretation, good lubricant management and pre-planned maintenance schedules help boost the bottom line of your company, especially if you rely heavily on effective and cost-efficient preventive maintenance programs. The process of analyzing oil samples is very similar to analyzing blood samples from a human being. The results show the health status of the machine and the condition of the lubricant. Through training, your employees will be equipped with the necessary skills at each stage of the oil analysis process. Prolong lubricant life by carefully monitoring its condition and treating or cleaning it to allow longer intervals between fluid changes. Enhance equipment life and reliability through proper lubricating and detecting problems such as contamination and excessive wear as early as possible. Reduce equipment downtime by identifying and correcting any lubrication problems before they become serious. Taking samples from well-selected points, for instance downstream of components but before they pass through filters. Collecting samples after the lubricant is well mixed and when it has reached its normal operating temperature. When a critical machine breaks down, and no one had seen this coming, production will be stalled until you have conducted expensive repairs or replacement of the whole unit. In the meantime, your productivity and revenues will suffer, and your clients may move to your competitors if deadlines aren’t met. To avoid all these headaches, connect with NTT Training today and register for the employee oil analysis seminar that will train your employees how to evaluate oil conditions and detect flaws that can result in downtime.